Giftgaming is a win-win-win that helps you win. Advertisers get exposure, developers get paid, and you get free virtual goods in mobile games plus coupons for discounts on meatspace purchases. Today, Giftgaming launched its service onstage at the TechCrunch Disrupt Europe in London. 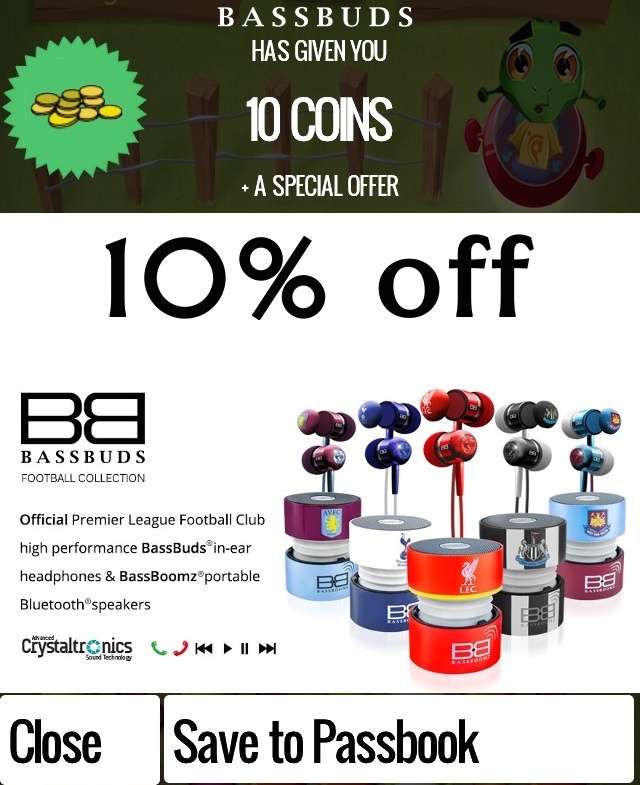 When you’re playing a mobile game like Fluid Football, you’ll be able to tap a Giftgaming icon for a free power-up with the option to add a coupon for 10 percent off headphones from Bass Buds to your Passbook. Just 1.35 percent of mobile gamers buy power-ups and virtual goods that help them out according to a recent Swrve study, but Giftgaming could let people try out their benefits without having to pay for them. “You don’t buy a Porsche without taking it for a test drive first,” Giftgaming co-founder and CEO Nick Hatter tells me. Hatter knows what gamers want. He’s been building games since he was 13, after all. He went to a Cambridge Startup Weekend event, and came up with pitch for Giftgaming at the last minute. The startup won our TechCrunch London Meetup competition, and raised £37,000 on crowdfunding site Seedrs. Hatter hired his business coach Charles Payne and brought on long-time adtech CEO Brewster Barclay as an adviser. Giftgaming has dev platform Marmalade set as a launch partner. If the pitch of delighting gamers with rewards sounds familiar, it’s because Kiip’s been doing it for a while, and has raised $15.3 million. But Hatter says that Kiip often requires you to give up your email address to get rewards, is focused on real-world prizes (though it does virtual goods now too), and its rewards only appear if you complete some achievement. Plus Hatter railed against the interruptive video ads Kiip’s started to show. Giftgaming uses Passbook integration rather than email to deliver coupons so no one can spam you, and its rewards can be made available whenever a publisher wants, so they’re monetization isn’t limited. The company plans to offer both cost per impression ads that advertisers pay for whenever they’re shown, as well as cost per action ads where advertisers only pay when a coupon is saved. Timeframe for the integration with Unity? We support Marmalade and experimental support for Unity is in the works. There are a lot of people in this space. With GiftGaming, you can serve gifts at any time. With other solutions where you have to watch a video ad, not everybody wants to do that. With GiftGaming, we can serve a lot more inventory. Are you the lone founder? Brought on a Head Of Business Development and a sales person is coming on as soon as possible. Who are the other publishers and developers who signed up? There is just one so far. Nobody is waiting to use it except for Fluid Games. Do you see big titles using the solution? Yes. This could work in paid-for games. You dont’ want to annoy the players. Is that part of your sale? Yes. It’s all about non-intrusive monetization. Players are the customer.